1943Dear Dad: Sunday is your day — and I certainly wish that we might enjoy it together. Because that is impossible, I take this means to wish you a world of health and happiness. You are doing your part in the great undertaking; just as I am here. Together we will be victorious, I know. Father's Day in 1943 was right in the midst of World War II; D-Day was still a full year away. There was heavy action in the Pacific Theater, and the Allies were regularly bombing the Axis powers on the European mainland, hoping to prepare for an eventual invasion. This card, from the USO Club in Fayetteville, North Carolina, is signed "Pvt. Pearson P. Knisley." 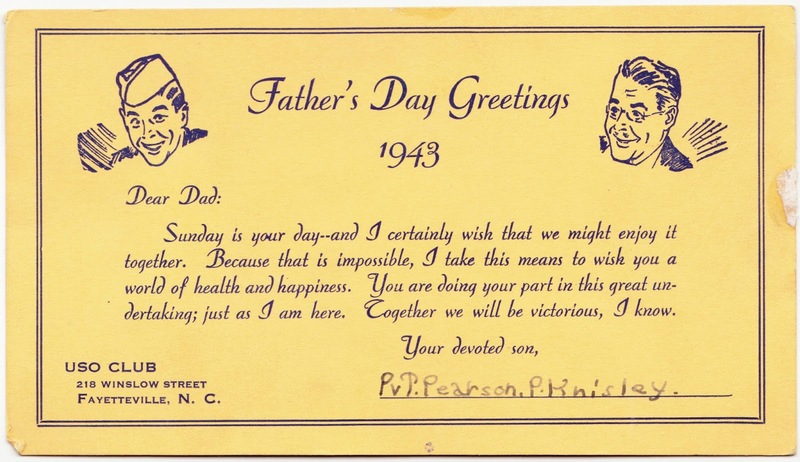 Pearson was the son who was serving in the military in 1943 and sent this card to his father, since it was impossible for them to be together on that day. A little research shows that Pearson Playfield Knisley lived from December 17, 1923, to February 22, 1998. He was born and died here in York County. His father, who received this Father's Day card, was Emory Earl Knisley (1896-1973). To continue the Father's Day theme, here are some photos of me and my dad, back when I was just a wee lad in 1971. He's still enjoying the beach, living down in Bradenton, Florida. Happy Father's Day, Dad!